1st Group Stage match of CLT20 2014 was played between Kolkata Knight Riders vs Chennai Super Kings at Rajiv Gandhi International Stadium, Uppal, Hyderabad. Kolkata with superb bowling of SP Natine and Ad Russel's firing inning of 58 runs of just 25 balls registered comprehensive win over Chennai by 3 wickets. AD Russle declared man of the match for his match winning inning. Earlier Kolkata won the toss and chose to field first and let Chennai to set target. Chennai got quick start with DR Smith and BB McCullum but, both fall in quick interwal. DR Smith made 20 of 13 balls and BB McCullum made 22 of 19 balls. SK Raina also started well but got out scoring 28 runs. In later overs MS Dhoni played super quick inning of 35 runs in just 20 balls and Channai managed to put 157 runs on board at the end of 20 overs. Following target of 158 runs, Kolkata could not got good start and MS Bisla(2), G Gambhir(6), MK Pandey(0) and YK Pathan(1) lost four wickets in quick sucessions. top 3 of 4 wickets picked up by Ashish Nehra. RN ten Doeschate and AD Russell took the charge and played superb innings of Kolkata. AD Russell made super quick 58 runs of just 25 balls with 5 massive sixes and 4 fabulous fours before lost his wicket to A Nehra. RN ten Doeschate played good cricket and remained not out till end scoring 51 runs and gave Kolkata comprehensive win in 19 overs. 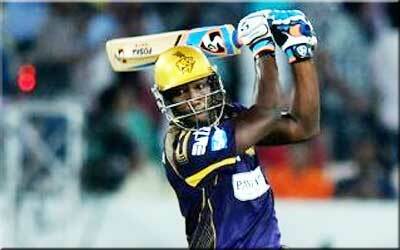 AD Russell (Kolkata) declared man of the match for his super quick 58 runs of just 25 balls.